Designed for all students, this course will explore the way that music functions as a form of communication, bringing perspectives from a broad range of disciplines, including music theory, music history, ethnomusicology, philosophy, psychology, and aesthetics. Topics will include aspects of music composition and notation. Observations will be applied to a broad range of music. This course has no prerequisites, and fulfills the Core Curriculum requirement in the Arts. Experience in performing groups with repertoire selected from a wide spectrum of literature. Limited outside engagements. May be repeated for credit. Junior and senior students will receive upper-division credit. Enrollment is by audition. Experience in small performing groups with repertoire selected from a wide spectrum of literature. Limited outside engagements. May be repeated for credit. Junior and senior students will receive upper-division credit. Enrollment is by audition. Coherently organized readings under the guidance of a music faculty member in an area of special interest to the student. A reading list and means of evaluation must be formalized in a learning contract prior to registration. Prerequisites: MUSC 303 and MUSC 211, consent of the instructor, and learning contract filed in the Office of the Registrar. Under the direct supervision of a music faculty member, a student undertakes a research project. A learning contract that specifies the research goals and methodology must be filed with the Office of the Registrar. A maximum of four credit hours of directed research in music (397 or 497 only) may be applied to major requirements in music. May be repeated for credit. Prerequisites: Consent of the instructor, and learning contract filed in the Office of the Registrar. A co-requisite course with any private music instruction. Music majors will be required to attend eight concerts per semester. Non-music majors will be required to attend four concerts per semester. Each concert designated as acceptable towards satisfying the requirement will have an attendance sheet at the door for the students to sign as they arrive and leave. 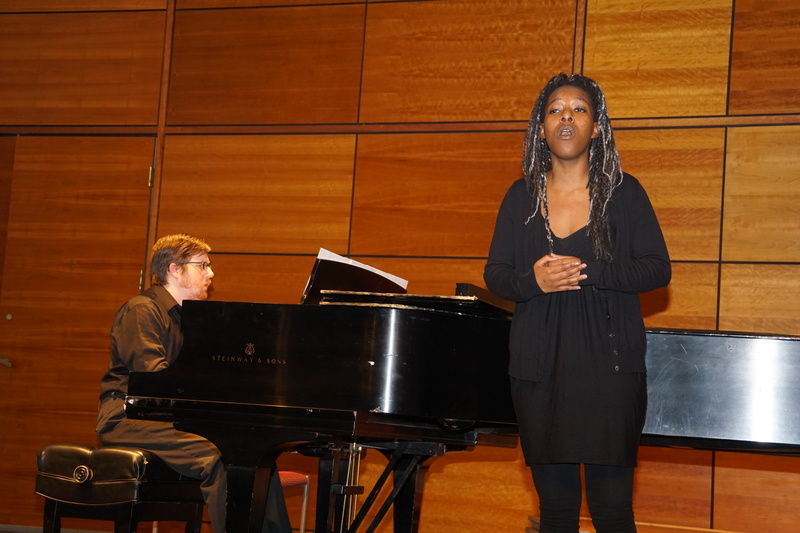 Acceptable concerts include student recitals in which one performs. Exceptions are the ensemble concerts, for which the performers do not receive attendance credit. Elements of pitch and rhythmic training from the recognition and performance standpoint. Includes rhythmic and melodic sight singing and dictation (one- and two-part) with keyboard harmony. These courses must be taken in sequence. Prerequisite for MUSC 202: MUSC 201. Elements of pitch and rhythmic training from the recognition and performance standpoint. Includes rhythmic and melodic sight singing and dictation (one- and two-part) with keyboard harmony. These courses must be taken in sequence. Prerequisite: MUSC 201.
Review of such fundamentals as notation, intervals, scales, key signatures, chord construction, and study of Western common practice harmony. MUSC 203 (with co-requisite MUSC 201) fulfills the Core Curriculum requirement in Arts. Co-requisite for MUSC 203: MUSC 201; Prerequisite for MUSC 204: MUSC 203; Co-requisite for MUSC 204: MUSC 202. The development of western music, from antiquity to the present day, encompassing both classical and popular styles. Ability to read music is not necessary. This course fulfills the Core Curriculum requirement in Arts. Designed primarily for music education students; includes group study, performance, and the teaching of voice and various instruments. Designed for the general student, this course serves as an introduction to music and musical practices around the world. This course addresses the challenge of listening to unfamiliar sounds as “music” and explores the relationship between music and society. This course fulfills the Core Curriculum requirement in Cultural Perspectives. This course, designed for the general student, traces jazz from its historical roots, and then follows its development to present day practices. The focus is on the artists and social issues that shape the idiom, using recordings, videos, films, and transcribed solos. The ability to read music is helpful but not essential for successful participation. The format is lecture/discussion. This course fulfills the Core Curriculum requirement in Arts. Specialized studies in western music history. May be repeated for credit if the topic is different. Check the online Schedule of Classes for topics and prerequisites. This course fulfills the Core Curriculum requirement in Arts. Ethnomusicology may be defined as the anthropology of music; it thus encompasses all of the world’s music and emphasizes the relation between music and other aspects of culture. The topics covered may include a specific regional tradition, a musical genre viewed cross-culturally, the methodologies of ethnomusicology, or a musical topic viewed from an ethnomusicological perspective. May be repeated for credit if the topic is different. Check the online Schedule of Classes for topics and prerequisites. This course fulfills the Core Curriculum requirement in Cultural Perspectives. Continuation of MUSA 174, designed particularly to help music majors pass the piano proficiency requirement, or to provide further instruction in piano to any student not advanced enough to enroll in MUSA 284/384. Instructor may, at his or her discretion, meet students individually, in groups, or as a class. An additional fee must be paid for this class. (See “Expenses and Financial Aid” section.) This course is repeatable for credit. Intensive study of techniques and repertory. Juniors and seniors will receive upper-division credit. May be repeated for credit. Enrollment is by audition. An additional fee must be paid for private instruction. (See “Expenses and Financial Aid” section.) Co-requisite for all: MUSA 200. Intensive study of techniques and repertory. Juniors and seniors will receive upper-division credit. May be repeated for credit. Enrollment is by audition. An additional fee must be paid for private instruction. (See “Expenses and Financial Aid” section.) Co-requisite: MUSA 200. Study of basic compositional techniques leading to the creation of original works for various performing media. Juniors and seniors will receive upper-division credit. May be repeated for credit. An additional fee must be paid for private instruction. (See “Expenses and Financial Aid” section.) Prerequisite: Consent of the instructor. Study of the theory of 19th-century music, with exercises in writing and analysis. Prerequisites: Successful completion of MUSC 202 and 204 or consent of the instructor; Co-requisite: MUSC 309. Study of the theory of 20th-century music, with exercises in writing and analysis. Prerequisites: Successful completion of MUSC 303, MUSC 309, and the Core Curriculum requirement in mathematics or consent of the instructor; Co-requisite: MUSC 311. Continuation of study of materials begun in MUSC 201 and 202. Drills in sight singing, melodic and harmonic dictation (diatonic, chromatic, atonal), reading music in all clefs. Prerequisites: Successful completion of MUSC 202 and 204 or consent of the instructor. An overview of the possibilities opened to musicians through digital technology. The course will include an introduction to music sequencing, the use of sampled sounds, digital sound editing, and computer music notation. Prerequisite: MUSC 203 or consent of the instructor. This course provides an overview of the industries that form the foundation and provide the delivery of the arts to the public. Topics include: Non-profit 501c3s, Grants, Boards, Artist Management, Marketing, Publicity, Fundraising, Administrative Structure, Publishing, Recording, Unions, Arts Councils, the NEA, Project Development, and Audience Engagement and Building. With special guest speakers. A study of the development of music in the Western world from classical antiquity to 1750. Prerequisites: Ability to read music plus completion of MUSC 203 (or its equivalent) are required. A continuation of MUSC 318 encompassing music from 1750 to 1900. Prerequisites: Ability to read music plus completion of MUSC 204 (or its equivalent) are required. A continuation of MUSC 319 encompassing music from 1900 through to the present day. Prerequisites: Ability to read music plus completion of MUSC 303 (or its equivalent) are required. A detailed study of musical forms (sonata, concerto, and rondo), and an introduction to advanced analytic techniques and the writing of formal musical analysis. Prerequisite: MUSC 303 or consent of the instructor. Study of the problems encountered when writing for orchestral instruments alone or in combination. The course will focus on writing and arranging for orchestra, both to provide practical experience in writing and arranging, and to enhance score-reading abilities. Prerequisite: MUSC 203 or consent of the instructor. A study of species and tonal counterpoint, with written exercises and analytical projects. Prerequisite: MUSC 303 or consent of the instructor. Study of beat patterns, baton techniques, and rehearsal techniques using critical score analysis of choral and instrumental literature. Class functions as its own performing laboratory. Designed for singers, this survey course introduces singers to the International Phonetic Alphabet and its use; the rules of correct pronunciation in English, Italian, German, French, and Spanish lyric (sung) diction; and the use of diction as an interpretive tool. Prerequisite: Music major status, or permission of the instructor. A variety of off-campus experiential learning opportunities can be arranged through the Career Development Center. The off-campus internship is an individually designed experience that allows the student to explore the relationship between learning in the classroom and the practical application of knowledge in everyday work situations. Prerequisites: Admission to the Internship Program and approval of the department chair. (See “Internships” under “Academic Policies” section.) Credit/no credit grading. Participation at the Alba International Music Festival, a two-week intensive musical experience involving the study of European music in a European environment. Singers will rehearse and perform with the St. Mary’s College Chamber Singers. Instrumentalists will rehearse and perform chamber music and sit in with various professional ensembles. All students attend daily concerts and numerous master classes. Students in composition will have private lessons and daily composition master classes. This course may be repeated for credit. Opera Scenes Class is designed for the student of singing interested in the various elements which comprise the preparation and performance of opera scenes. The class will treat such issues as text and musical interpretation, characterization, blocking, movement and scenic elements. Students will be cast in various scenes appropriate to their development and will present their work in a public performance at the conclusion of the semester. Enrollment is by audition. This seminar will examine performance and scholarship. The aim of the seminar will be to guide students as a group as they begin the design, preparation, and execution of a project that contains both musical performance and a research component (see MUSC 494). Students should request guidelines for projects from the music chair at the beginning of the junior year. Prerequisites: MUSC320, and MUSC 304 or 332, or consent of the instructor. Guided by a faculty mentor designated by the Music Department chair, students will design, prepare, and execute a project that features performance and research. Typically, the performance will be a public, full- length recital, but other options are possible. The research component normally will consist of a paper on a topic related to the public performance and that demonstrates the student’s ability in music history or theory. The project must demonstrate methodological competence. It must draw on and extend knowledge, skills of analysis, and creative achievement developed through previous academic work. It must include a reflection on the social context, the body of literature, or the conceptual framework to which it is a contribution. Prerequisites: MUSC 493 and approval of the proposed project by the music faculty.